We’d love your help. 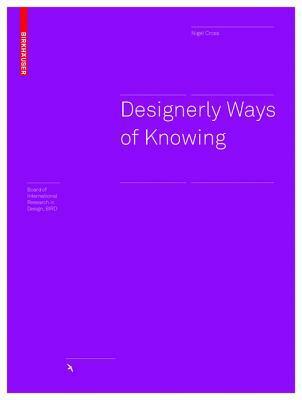 Let us know what’s wrong with this preview of Designerly Ways of Knowing by Nigel Cross. Das Buch bietet einen faszinierenden und qualifizierten Einblick in die Welt der Design-Kreativitat. Die sieben Kapitel behandeln Kernthemen wie: die Fahigkeit zum Design-Entwerfen, naturliche und kunstliche Intelligenz im Design, der kreative Sprung, die kreativen Strategien, Problem-Formulierung, das Generieren von Losungen, Design als eine (wissenschaftliche) Disziplin. Das Buch bietet einen faszinierenden und qualifizierten Einblick in die Welt der Design-Kreativitat. Die sieben Kapitel behandeln Kernthemen wie: die Fahigkeit zum Design-Entwerfen, naturliche und kunstliche Intelligenz im Design, der kreative Sprung, die kreativen Strategien, Problem-Formulierung, das Generieren von Losungen, Design als eine (wissenschaftliche) Disziplin. To ask other readers questions about Designerly Ways of Knowing, please sign up. This book an amazing book that theorizes some aspects of design cognition. A great read for any design researcher or curious designer. It seem to be a short read, but I would suggest you take time and read it. Then discuss it with your design friends. This helped me to understand the book better. In brief, it is like a survey paper on design cognition. The concept of Designerly Ways of Knowing developed in the late 1970s in association with the development of new approaches in design education; Cross aimed at thoroughly stressing that there are forms of knowledge peculiar to the awareness and ability of a designer and through the outlines within his book he looks to uncover the severity of neglect that has been executed when it comes to various parts of the designers‟ consciousness and the allocation of its value as an independent discipline. The concept of Designerly Ways of Knowing developed in the late 1970s in association with the development of new approaches in design education; Cross aimed at thoroughly stressing that there are forms of knowledge peculiar to the awareness and ability of a designer and through the outlines within his book he looks to uncover the severity of neglect that has been executed when it comes to various parts of the designers‟ consciousness and the allocation of its value as an independent discipline. In this context he guides the reader through the nurturing of these qualified designerly talents and the unique stimulus needed within the education of these individuals, rather than approaching it from the scientific- or humanitarian disciplines‟ point of view. With valuable research, thoroughly executed, Cross provides a much needed overview of some of the historical concerns and commonly misunderstood processes that have emerged with regards to the relationship between design and science. laboratory-based work, theoretical reflections and various amalgamations of previous work from various researchers have lead Cross to compiling that which is necessary in creating a traceable thread and layout of sound research, backing the thoughts and concepts read within each carefully titled chapter. In my view, upon research compiled within the Designerly Ways of Knowing, one can merely state that since the publication of this book, the field of study has grown considerably, as both design education and design research have developed together into a new discipline of design. This publication has provided a unique and enlightened insight into a field of study with important implications for design research, education and practice. designers (whether it be architects, engineers, industrial designers, etc.) have an inherent inclination towards particular designerly ways of knowing and thinking, has revolutionised how other practices could begin to understand the once elusive cognition based upon intuitive methods of constructive problem-solving solutions. Great overview of what one eminent design researcher/theorist, viz. Nigel Cross, has learned under the large umbrella of "design science", including it's nature, nurture, relationship to technology and computational tools, expertise, and creative processes. It is actually a collection of papers published over the years. The general theme is indicated by the title, viz. that there are "designerly" ways of knowing that are distinct from other forms of knowing, e.g., the scientific method. This "kn Great overview of what one eminent design researcher/theorist, viz. Nigel Cross, has learned under the large umbrella of "design science", including it's nature, nurture, relationship to technology and computational tools, expertise, and creative processes. It is actually a collection of papers published over the years. The general theme is indicated by the title, viz. that there are "designerly" ways of knowing that are distinct from other forms of knowing, e.g., the scientific method. This "knowing" describes a system of thinking that includes 1) a distinct phenomenon of study, 2) unique methods for inquiry, and 3) an umbrella culture of values. The bulk of the book is spent fleshing out an argument that "design" is such a system of knowing in its various details. I have followed Nigel Cross' writing for the past 35 years. He has provided profound insights into why designerly ways of learning, sensing, synthesizing and filling the gaps is at the heart of what we do at SonicRim. Good overview of research efforts and results concerning 'design', process, method and application.